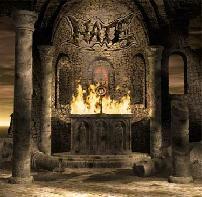 Hate are a Polish Death Metal act with a satanic edge. The quartet has to date released 5 full length albums, the most recent of which being 'Anaclasis: A Haunting Gospel of Malice and Hatred', as well as a DVD. 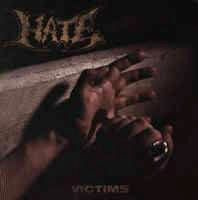 HATE was formed in Warsaw, Poland in 1990 by guitarist and vocalist Adam The First Sinner, guitarist Qack and drummer Mittloff. During the underground years 1990-1995 the band gained great reputation with demo tapes "Aborrence" (1992), "Evil Art" (1994) and "Unwritten Law" (1995) which contained extreme death metal inspired by the American-like kind of the style. There was, however, much more to it than just another death metal act in the Polish underground. There was something that clearly showed at the band's early stage performances - certain atmosphere of seriousness that has never left the band in spite of changes in the lineup. Is it the name of the band itself, banners with inverted Christs attached to the pentagrams (that have always accompanied their shows) or the attitude of this hellish horde killing with sound with a surgical precision, that made such impression on the audience? Hard to tell (perhaps all of them together), but one thing is by no means certain: they crashed, crash now and will crash like not many other bands around. In 1996 Hate signed their first record contract with a small underground label - Novum Vox Mortiis. First two albums were released on the label: "Daemon Qui Fecit Terram" (1996) and legendary "Lord Is Avenger" (1997). Both were officially distributed within the territory of Poland but numerous copies appeared on European market as well as in the East through some underground distros. In 1999 Hate entered Selani Studio, Olsztyn to record mini lp. "Victims" which was released in 2000 on Metal Mind Records - the major Polish label - and gained the band a kind of cult reputation. It was the first album where one could hear the band's style crystallized with all the characteristics of the sound they will present on next materials. It was high time for Hate to make it to the western world and try their chances there. The occasion appeared one year later during some shows with Immolation when the band got contacted with American record label Dwell Records. The collaboration started with a compilation "Gateways To Hell: Tribute To Slayer (Vol. 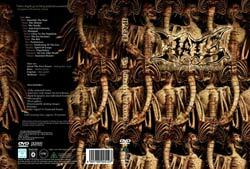 2)", on which Slayer's track "Postmortem" performed by Hate was included. That one song (definitely the best one on the compilation) made the band noticed in USA and resulted in several offers from different labels. 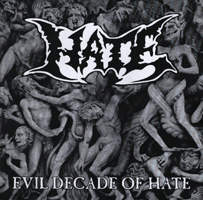 In 2000 Hate signed their first record contract outside their homeland with WW3/Mercenary Music and released their first official CD in America which was a compilation of the albums- "Lord Is Avenger" and "Victims" previously released in Poland on Novum Vox Mortiis. 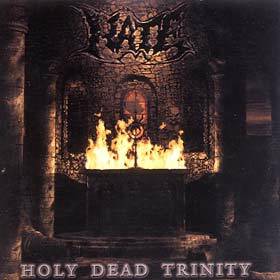 The release was entitled "Holy Dead Trinity" and had its American premiere in 2001. The material got rave reviews and made the band's name well known among metalheads in USA. 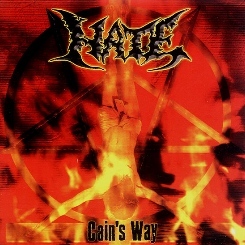 One year later Hate entered Seracos Studio, Warsaw to record their next album "Cain's Way". The material was released in 2002 on WW3/Mercenary Music strengthening the band's position on American continent and pushing Hate to some higher level. The album was licensed for Europe to Blackend Records several months later. At the time of the European premiere the band was undergoing some changes in the lineup - two musicians (Ralph - git and Mittloff - drums) were made to leave and replaced by fresh blood - Kaos (git) and Hellrizer (drums). The change strengthened the band giving it some new perspective and motivation. How needed the changes were, one could notice one year later (2003) when the new material "Awakening Of The Liar" emerged from Hertz Studio. This excellent album undoubtedly beats up most of the extreme metal scene of today. Its ferocity, precision and (rare) charisma kill from the first seconds to the very end of this masterpiece. 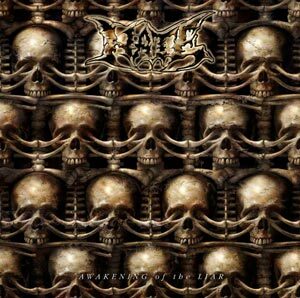 Hate proved to be one of the best extreme metal acts around and it seems that "Awakening (...)" is just the beginning of their further, more dynamic career. The album has had its European premiere in March 2004 on Listenable Records and the American one on Mercenary Music. Meanwhile the CD scored the first place in the summary 2003 (readers' voting) in the most influential Polish magazine - Thrash'Em All. In February 2004, HATE shot their first official audio-visual stuff which is going to be released in Autumn on Poland-situated label Metal Mind Productions. The material was recorded during one concert at TV Studio in Cracow, Poland, where the band played in company of Carpathian Forest, Carnal Forge and Gorgoroth. The DVD titled "The Liatanies Of Satan" will contain 15 live tracks (including a new piece HEX, two cover songs and most of the material from "Awakening Of The Liar" album.